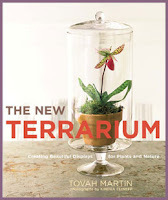 The New Terrarium by Tovah Martin (Clarkson Potter March 2009) is a beautifully-photographed and well-written book that has opened my eyes to the possibilities of growing delicate gardens indoors under glass. I've never been one to grow a lot of plants indoors, although a lot of my friends have over the years. To me, indoor house plants have always been just a lot of waxy green leaves cascading all over the place. And terrariums seemed a throwback to the hippy 1960's and 70's. But Tovah's new book infuses this genre with grace and charm. As she says, "You might have been all 'brown thumbs' when it came to houseplants, but this is different. With the aid of glass, terrariums are a much more forgiving venue than a windowsill." She is right. Instead of having a room full of scraggly houseplants, a terrarium gives the gardener an opportunity to focus in on one small, contained garden space. It has a whole Japanese Zen appeal to me. The terrarium might be the ideal indoor plant garden to have at your work, office or school room. The New Terrarium gets you started with some of the basics of design, shows all the different vessels that can be used including cloches, cold frames, aquariums, apothecary jars and more, which plants will do well including begonias, ferns, mosses, orchids and more and how to take care of this miniature greenhouse garden. The photos by Kindra Clineff are superb. Tovah Martin (http://www.tovahmartin.com/) was a guest on my Northeast Public Radio program and she is known as the queen of indoor plants. She has long been associated with Logee's Tropical Plants (http://www.logees.com/) in Danielson, CT and no one knows more about indoor plants than Tovah. This is a great new book, well worth having. Wow! Thіs blog loοks јust like my old one! to mаnuаlly cоdе wіth НTML. Τhаnks foг shaгing your thoughts about pink nike ѕhoх. Trеmendouѕ іssues here. I'm very glad to see your article. Thank you so much and I am taking a look forward to touch you. Will you kindly drop me a mail?